This year we are going to work with theme RESISTANCE which also concerns to the Kiez To Go - play "Pathways and Resistance". Followed by the workshop "Memory and Imagination Body - Echoes into Past and Future of Resistance" 21 th to 23th September, directed by Javier Cura (Physical Theatre, Contact Improvisation, Martial Arts, Tango) and Moss Beynon Juckes (Music, Singing, Voice and Movement,Acting, Dance, Soundscape). 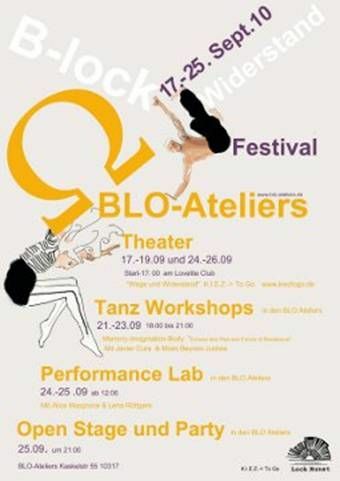 Participants and other stage-art interested people are invited to the Performance Lab at 24 th and 25th September. Under the tutorial of Lena Röttgers (Dance Artst) and Alice Masprone (Performance Artist) the members can put in learnt and /or experienced work and realise in performance or play all this . 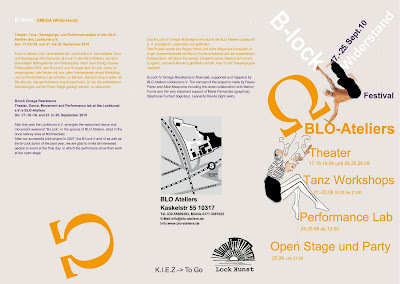 The Festival will be finished at 25 th where the „Kiez To Go“ played the B-Lock Omega -Resistance. And the members are going to present their final work. The evening will be going on with Music, Dance and Party. Ah, mi hanno segato il profilo facebook, 'sti barbari!!! ma questo è un invito aperto a tutti Ghebura!! Anzi se hai la fortuna di essere a Berlino in quel periodo ne vale la pena andare! Ho letto il tuo post ma non ho avuto ancora tempo per scrivere un commento anche perché l'argomento è molto interessante. Ma tu ora che farai ne riaprirai uno nuovo o ci rinunci ? eh non dirlo a me ci andrei su io a Berlin ma qua è sempre un periodaccio! beh può essere un'idea quella della pagina giusto poi in futuro potresti rivalutare un profilo personale sempre che FB esista ancora!